Fans of Kesha and Macklemore rejoice! Hot on the heels of their recent collaboration for “Good Old Days,” these two pop icons have banded together to become an unstoppable force on an enormous tour across North America! 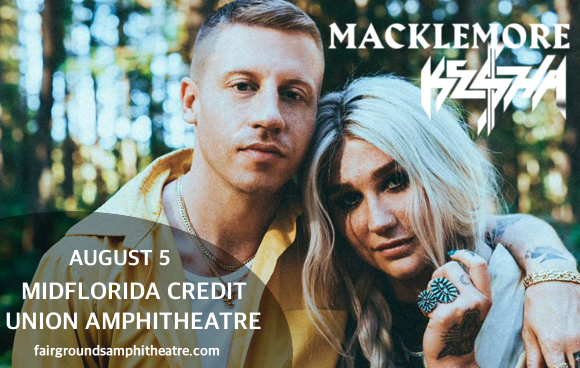 Get ready to see them both at the MidFlorida Credit Union Amphitheatre on Sunday 5th August 2018 – get your tickets NOW! As for Kesha, her most recent release, “Rainbow,” is one of her best and most important albums to date, with huge approval from music critics across the board. Featuring a wide variety of genres and influences over the predominant electronic nature of her first album, and focusing on themes of empowerment and self-love, with guest appearances from Parton, Eagles of Death Metal, and The Dap-Kings Horns, it’s been well worth the five-year wait. We can hardly wait to see what the two have in store for us on the Adventures of Kesha and Macklemore North American tour!! What are you waiting for?? Grab those tickets FAST while they last! !